www.theshipsblog.net. This is an independent blog following the Harwich Mayflower Heritage Centre/Project. If you have any questions, please contact the author using the button below. Until the proposed ship build was halted in 2014, this blog contained regular (unofficial) updates on the ill fated build of a full size sea going replica of the 'Mayflower' in Harwich. The Training centre at the Project was closed in 2016. Copyright in the content and photography within this site is with the author and may not be used elsewhere without permission. I have no connection to, or any affiliation with the Project. The views and comments expressed here are solely my own and do not in any way represent the views of the Harwich Mayflower Heritage Centre. Any errors or omissions in this blog are my own and do not reflect on the staff or volunteers at the Project. About this blog and the author. I usually do an ‘end of year’ update here, but due to an extended period of travelling, and wanting to wait until the Project’s cut off date (*”If funds are not in place by the cut off point of March 2018, then trustees have to look expand their vision to encourage visitors to Harwich”) I decided to wait for any news, and to update the blog a little later than usual. * “The charity is also rebranding itself as the Harwich Mayflower Heritage Centre as it looks to create the biggest tourist attraction in Tendring”. Still no shipbuild. One would assume a rebranding would be just that. A changing of the brand, removing the old name and replacing with the new. But this is not the case. On September 22nd 2017 a company called “The Harwich Mayflower Heritage Centre” was set up with a secretary (Graham Richardson) and four directors (Robert Clow, Robert Day, Tony Elliston and Fred Nichols). “The Harwich Mayflower Project” still exists and in Jan 2018 a new and 17th Director ( Andrew Winmill) was added to the existing ones (John Acton, Robert Day, Tony Elliston and Fred Nicholls). It is also worth noting that there is no registered charity in the name of “The Harwich Mayflower Heritage Centre”, although the “Harwich Mayflower Project” is registered as a charity. It seems that the “Project” is incorporated under the “Heritage” umbrella. As there is no “Heritage Centre” charity registered, one would assume they are no longer soliciting for public donations in the “Heritage” name? Hopefully all will be made clear when the official website is back online. Maybe the “Heritage” is museum related and NOT charitable, while the “Project” is to do with shipping and IS charity funded? But if it’s one entity, “The Heritage Project”, how does it stand regarding charity status and taking donations from the public? As we reach March, with the Project/Heritage centre website down yet again and with no Mayflower build taking place since 2014 and no announcement of funding, one would assume that the build will not go ahead and they will build the promised land-based project instead. If I hear different I will of course update the blog. 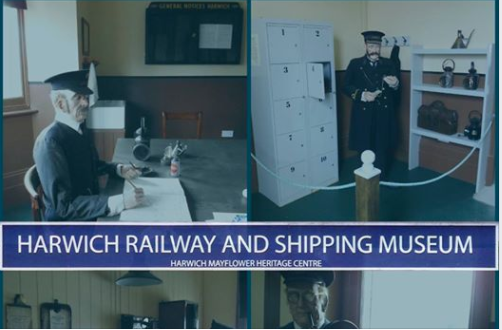 The Project/Heritage centre has made some progress in the last year with the opening of a Railway/shipping museum, which I hope will be of benefit to Harwich and visitors alike. The picture below is from theHeritage centre/Project facebook page. As Harwich has a long, varied and extremely interesting maritime history, hopefully it wont be long before the museum reflects this. That’s it for now, not much to say as there seems to be not much happening regarding the shipbuild, and there seems to be a lack of updates at the moment. EDIT: The following was sent as a comment to this post, but I feel it needs to be placed here as an update. *quotes taken from The Harwich and Manningtree Standard newspaper. Just to say that in the last ‘Tendring News’ magazine the HMP stated that the new planned ‘ocean sailing’ Mayflower replica was dead, however a team of workers and shipwrights will start on a Harwich based replica this year. Tom Daly has been made president of the HMP. Still no build, just a name change. Enter your email address to follow The Ship's Blog and receive notifications of new posts by email.